It's been years since I last wore a pair of 'spikes' - specially bought for a stage performance with some other girls. Yours are by far the coolest I've ever seen. Please do show us 'size 8 1/2, right' when it's done. Very colourful and decorative to find a home in someone’s house!! I admit it, those shoes are pretty amazing. Lindsay - the shoe was recently accepted into a juried show at a local gallery, though no one was interested enough to buy it. I'm currently working on 'Size 8 1/2, Right'. 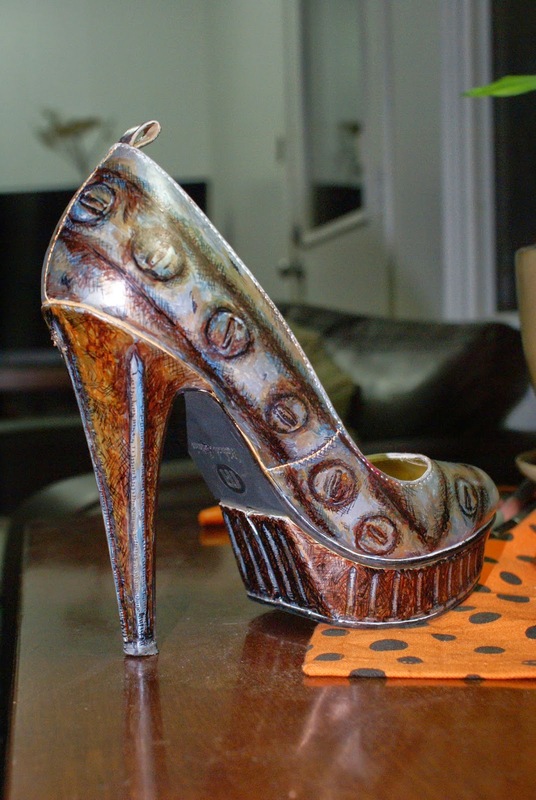 Kelline - there's only one, as it's not meant as footware, but as art. glad you liked it. I love your stuff, haven't been blogging much...and now I wonder do I know you? Who is Granny Fiddler?